Porches are also an important part of the house. For starters, these are the elevated, roofed spots just outside of our exterior doors. People usually place a few outdoor furnishings there to relax and have a good view of the outside. Porches vary in design of course, but people seem to have a unified appreciation for lounging on areas where the wind blows and the plants look soothing to the senses. 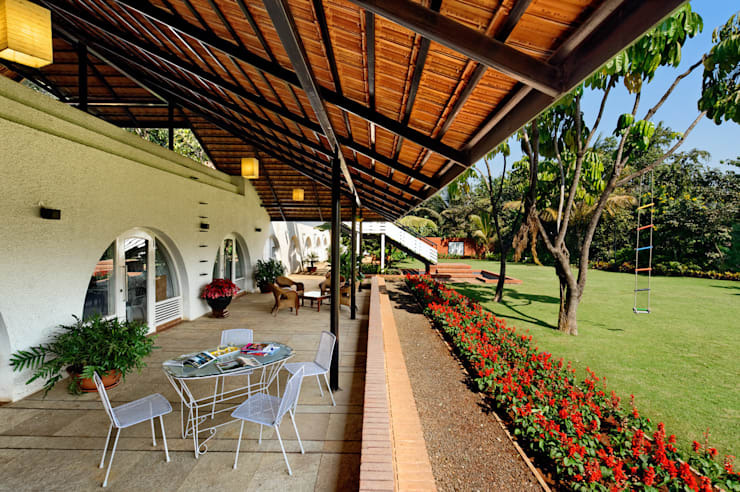 In India, there is a fascinating porch that attaches to a sophisticated bungalow. See what we're talking about by reading further. We're going right ahead and show you the porch of our dreams. Rough white concrete walls highlighted by warm outdoor lights with ceramic flooring and brick-lined low barrier, the porch just stuns anyone privileged to see it. 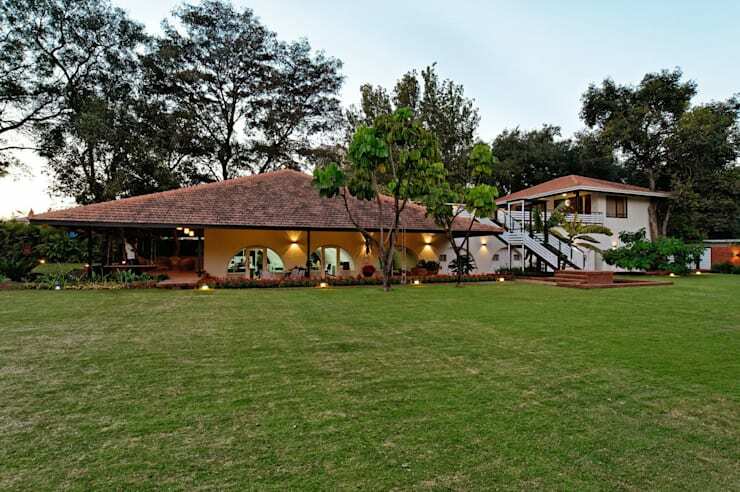 The quaint landscape beyond it likewise complements the luxury of the entire setup. Scouring the old look of the house shows that the porch we revealed earlier was not part of the original design of the building. Nonetheless, you get to see the same arches preceding the interiors. Instead of the edifice as the highlight at this time though, the surrounding plants seem to be more interesting. 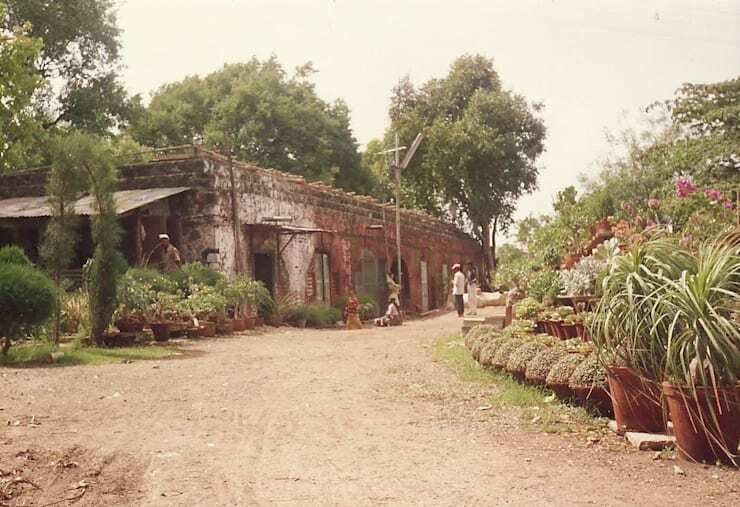 An even older image of the structure shows how it once was used as a warehouse. Apparently, this warehouse had also been intended to become a weapons store which didn't really come to fruition. 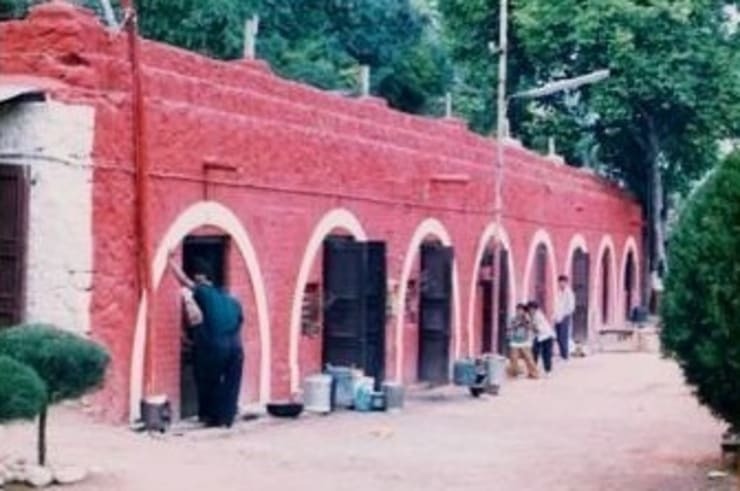 In any case, you'll notice that the arches here had just been outlines to the sets of wooden doors. From the once crumbling warehouse, the architects have turned it into an elegant and rustic bungalow with a whole lot of Mediterranean inspiration. 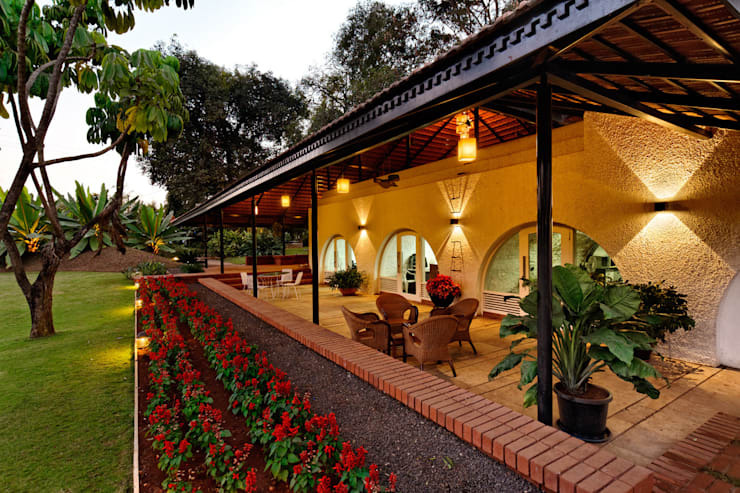 We especially love the rustic effect of the terracotta-tiled roof and the romantic yellow lights from afar. 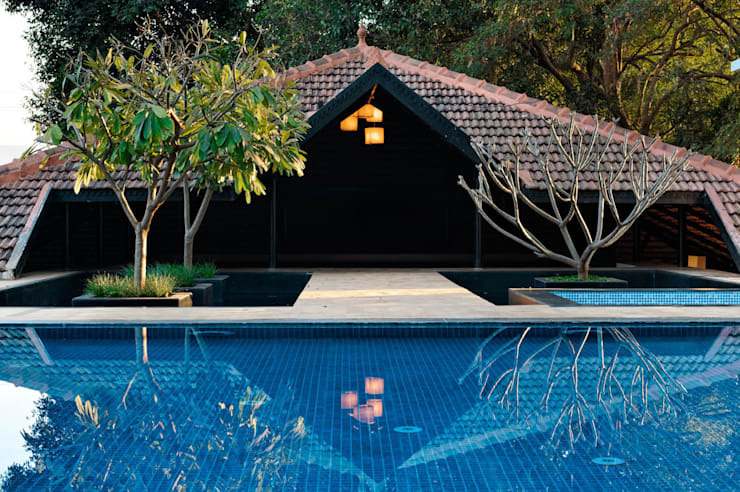 The bungalow is the same flat-roofed structure of the past, enhanced by the attached hip roof that not only enchants passers-by but also elegantly shelters the porch. The space here has been elevated which is also classified as a terrace. Since it's a wide porch or terrace, more outdoor seats and tables can be placed here. They even varied wicker and steel which still complement the whole ensemble. 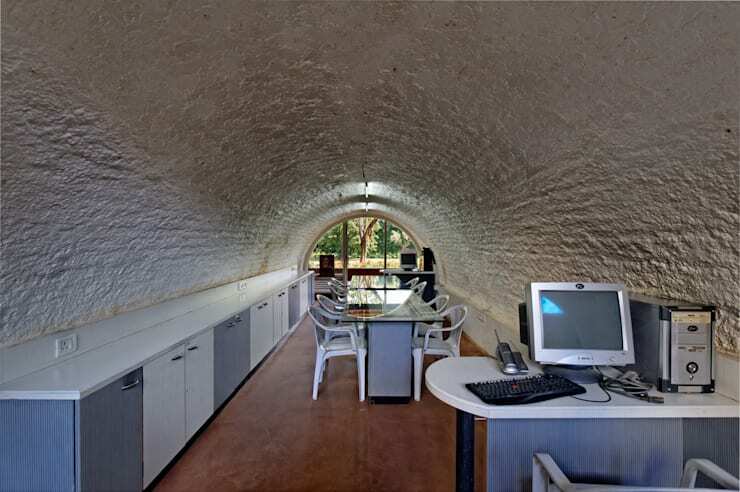 Since they maintained much of the main structure, this particular arched vault had been converted into a savvy office space that has neutral white and grey color palette. It definitely seems like a cool spot to work at. The white color here also brightens and eases an otherwise cramped and dark tunnel ambiance. 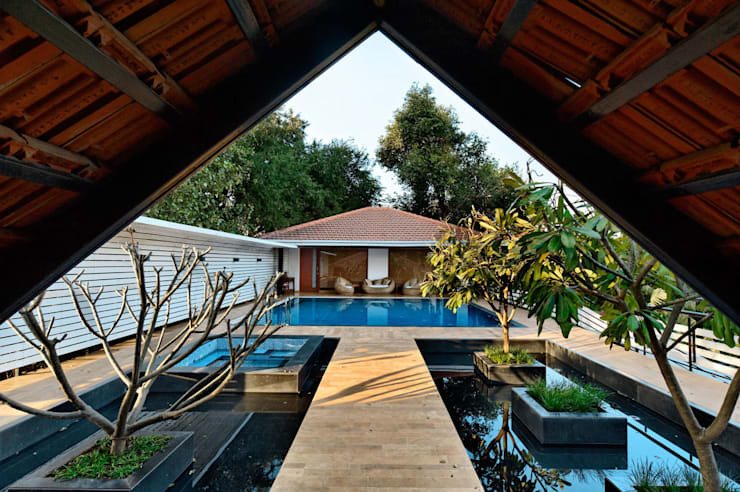 On the deck of the house's one side lies the pool area completely furnished with a nice wooden flooring for the sides, wicker furniture set and a long pergola too which you'll see more clearly on the following image. Here's the view of the pool area from the adjacent part of the deck. It's quite fancy given the smooth wooden catwalk that's lined by decorative pools on the sides with a jacuzzi on one. Since we just can't get enough of this area, here's a more stunning view of it and the adjacent deck that already leads to the open-hip roofed portion. Doesn't this just match well against your favorite spas and resorts? 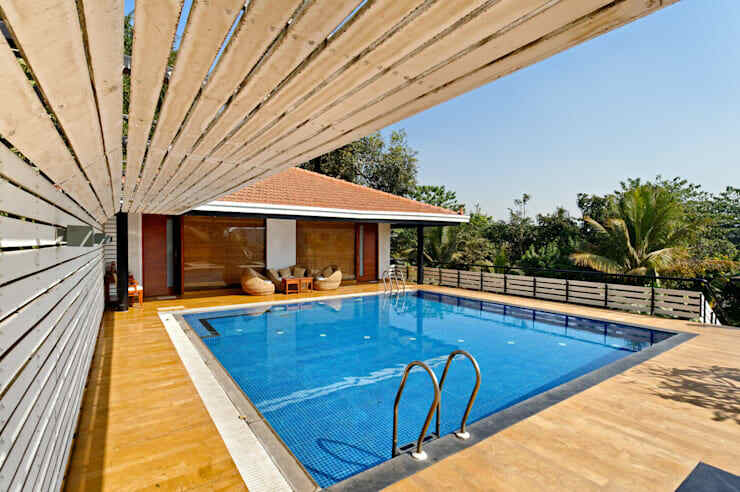 It may even be better because the pool and the additional relaxing design is all yours to enjoy!